STORRS - For a certain demographic from a certain generation, it was the “Rocky” soundtrack. A decade or two later, in some of the same neighborhoods as well as those far away, it was DMX’s “Ruff Ryders.” More recently it’s been Fort Minor or Youngbloodz blaring through the headphones of your favorite basketball player. OK, perhaps athletes’ musical preferences for pregame ‘hype’ music has always run the gamut and can’t be stereotyped. UConn center Josh Carlton, though, isn’t so dependent on such beats. He has been using a different pregame ritual during his recent hot streak for the Huskies. The java seems to be working for Josh these days. The 6-foot-10 center is starting to become a force for the Huskies. He had 11 points on 4-for-4 shooting to go along with six rebounds and four blocked shots Saturday against the Shockers. And over his last five games Carlton is averaging 10.4 points, 7.2 rebounds and is shooting 73.3 percent from the floor. Coach Dan Hurley admits Carlton’s development is one of the most important boxes to check if UConn hopes to continue to improve. And one of the biggest ways Carlton can improve, is to keep his energy up. Hence, perhaps, the coffee. “He gets mad in practice sometimes and says ‘You’ve got that low motor stuff.’ I try to not show a low motor and keep that high motor,” Carlton said. On Saturday, UConn raced out to a big lead against the Shockers. Nearly all of the Huskies contributed to the team’s hot start, perhaps none as impressively as Carlton. He had seven points, four rebounds and four blocked shots in the opening 12 minutes of the game, helping stake his team to a 28-12 lead. “He has the skill level but now the motor’s picking up, the rebounding, the defensive presence. Those were some impressive blocks today,” Hurley said. Now that’s strung together a few good efforts, Carlton has the belief that they can become the norm. “I just have my own confidence. And when I show confidence in myself, the guards have confidence in me. They see I want the ball and I want to try and make a play with it,” Carlton said. With Carlton’s help, the Huskies (12-8 overall, 3-4 American) have won consecutive games for the first time in more than a month and have if nothing else separated themselves from the bottom of the American Conference. Its latest victim, Wichita State (8-11, 1-6) has lost seven of its last eight games. Before Saturday, UConn had not played in seven days, a rather odd break in the middle of January. But the break didn’t seem to affect the players this time, including Carlton. Hurley has likened this season to a freshman campaign for Carlton, in part because he’s getting more of an opportunity to play this season than he did in the last. 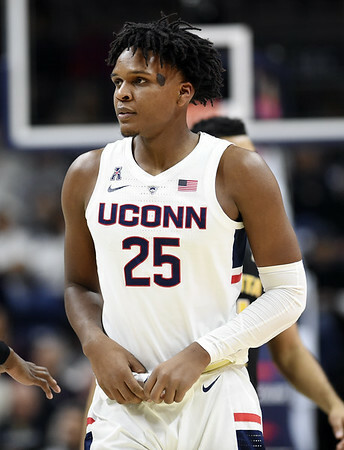 And in part because Carlton wasn’t perhaps 100 percent ready for the rigors of college basketball and college life when he arrived at UConn last summer. Carlton arrived in Storrs from DeMatha Catholic in Hyattsville, Maryland, as a bit of a wide-eyed, 18-year-old. (If it makes some Husky fans feel old, Carlton was born just 32 days before UConn won its first national championship in 1999). Of course, Vital admits Hurley wasn’t the only one yelling in hopes of motivating Carlton. He’s enjoying his solid play lately but the Carlton is truly anxious to take advantage of now is UConn’s upcoming opportunity. The Huskies can earn their third straight win, and their biggest of the season, if they somehow knock off American Conference preseason favorite Central Florida Thursday night in Orlando. Hungry, yes, and also thirsty for a good pre-game coffee. Posted in Newington Town Crier, UConn on Monday, 28 January 2019 21:21. Updated: Monday, 28 January 2019 21:23.